Joachim was born on January 17, 1923 in small town called Seelow, which is on the border with Poland. It takes about an hour by train from Berlin to Seelow. Until August 1939, Joachim lived in Seelow with his parents, Martha and Louis, his older sister Ruth, and his older brother Willi. 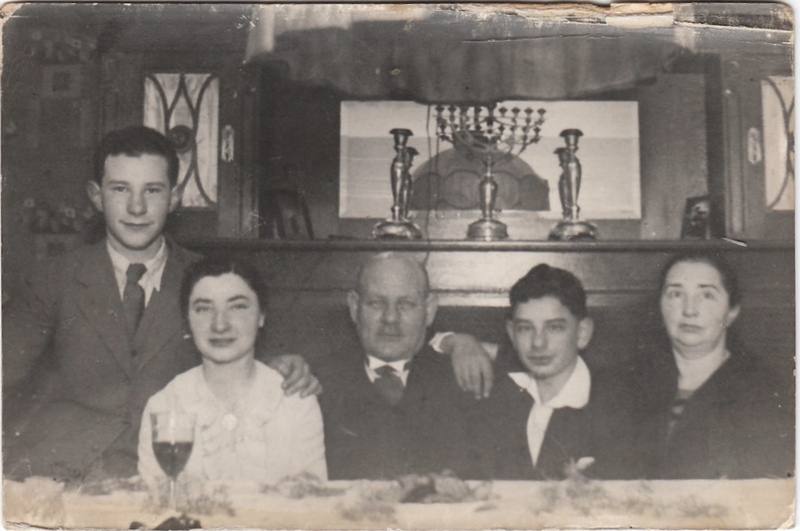 One of the family’s prized possessions is the only photograph of all five of them in their house, celebrating Joachim’s Barmitzvah in 1936, in front of the Chanukiah. Joachim lived a normal boy’s life, going to school and playing with his friends, brother, and cousin. He was a keen footballer and played for the local football team – Seelow Victoria. My father, Willi, is on the left, with his arm round his sister, who was sent with children from the orphanage, where she worked in Berlin, to Riga, where they were all shot immediately upon arrival. Joachim is the second from the right. With the Nazi rise to power, it was clear to the family what was in store for Jews. This became even clearer when a particularly unpleasant incident took place, which involved members of the family being beaten up and then taken into temporary custody by the police. Joachim’s father was taken to Sachsenhausen, but was later released. Joachim’s elder brother Willi managed to leave Germany in April 1939. On arrival in the UK, he was sent to Kitchener camp; he went on to enlist in the British Army and to become a member of Churchill’s German army – consisting of German and Austrian refugees who fought against their birth country in order to defeat the Nazi evil. At the end of August 1939, at the age of 16, Joachim managed to get out of Germany, just days before war broke out. He’d been a pupil at the ORT school in Berlin, which had been set up in 1936 for German Jewish children who could not go to mainstream schools because of Nazi persecution. Under the protection of British ORT, the school survived Kristallnacht and the November 1938 pogrom, remaining the only institution unaffected by the escalating trouble. The school’s equipment was bought by British ORT, which meant that to confiscate it would be to seize the goods of a foreign country, which would in itself have been a declaration of war. Oddly enough, this journey was sanctioned by none other than Adolf Eichman, bowing to the constant petitioning of Lieutenant Colonel Levey, a retired British army officer. Together with his fellow students, Joachim travelled from Berlin to Cologne, crossed the border to France, took the ferry to Harwich, then took another train to Waterloo Station. From Waterloo, under the supervision of Lieutenant Col. Levey, they marched to Rawton House in Whitechapel and were then put on another bus to the county of Kent – the Kitchener camp. Presumably Joachim was reunited with his older brother, Willi, who had arrived at the camp in April 1939. From Kitchener camp, the ORT boys travelled to Leeds, where the ORT School had been relocated. In Leeds, Joachim trained to become an electrician. He moved to London after the war and with his business partner, Frank Goldberg, started doing electrical work. They used to take their tool bags on the buses to visit their customers. Gradually, the client list grew and they created a successful business in Belsize Road, London NW6. Joachim met his wife, Sigrid, in 1964 and they married in March 1965. Initially, living in West Hampstead, they moved to Edgware in 1967 and had two children, Anthony and Ruth. Joachim died in January 2010, on his 87th birthday.